WASHINGTON, D.C., March 15, 2018 — An emerging field that has generated a wide range of interest, spin caloritronics, is an offshoot of spintronics that explores how heat currents transport electron spin. Spin caloritronics researchers are particularly interested in how waste heat could be used to power next-generation spintronic devices. Some of these potential devices range from ultrafast computers that need next to no power, to magnetic nanoparticles that deliver drugs to cells. The thermally driven transport application of spin caloritronics is based on the Seebeck effect. In this phenomenon, the temperature difference between a ferromagnet (FM) and a nonmagnetic metal (NM) produces a thermoelectric voltage, and converts the heat directly into electricity at the junction between the two materials. Recently, researchers from the China University of Mining and Technology have theoretically exposed the fundamental aspects of this thermal transport along double-stranded DNA (dsDNA) molecules. The researchers reported their findings in the Journal of Applied Physics, from AIP Publishing. "The results of our research open up the possibility of creating new functional thermoelectric devices based on dsDNA and other organic molecules," said Long Bai, a China University researcher and a co-author of the paper. It is known that DNA behaves as a conductor or semiconductor, and there have been numerous studies on incorporating DNA molecules into spintronic devices. But, until now, researchers have not explored how heat bias can control the spin current in a dsDNA molecule. 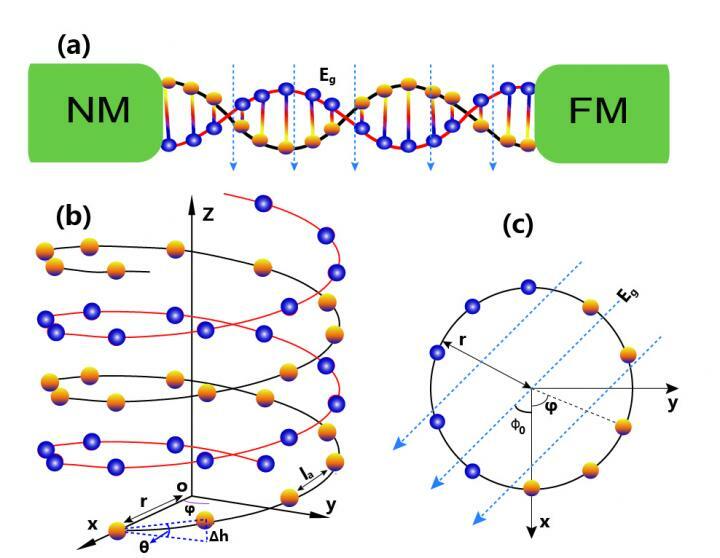 By employing the nonequilibrium Green's function method, researchers investigated the heat-induced spin-Seebeck transport through a dsDNA molecule sandwiched between an FM lead and NM lead under various temperatures. They discovered that their theoretical dsDNA-based device can act as a spin (charge)-Seebeck diode, switch or transistor. "We have found that the spin (charge)-Seebeck current driven by temperature bias exhibits signi?cant recti?cation behavior, and thus a spin(charge)-Seebeck diode is obtained," Bai said. The researchers focused on the inherent chirality feature in dsDNA that acts as a filter to enable spin selection. Chirality happens when a mirror image of an object is not superimposable — for example, hands and feet. DNA's twisted double helix structure features chirality. This DNA structure aligns electrons in one direction as the temperature gradient drives the electrons from the hotter ferromagnetic material to the cooler nonferrous metal. "The asymmetry of the two strands in a dsDNA can induce a larger spin-polarized transport," Bai said. "However, it does not mean that the asymmetry allows the spin to go one way or the other." The researchers discovered that the incessant increase of the helical angle in their dsDNA spin-Seebeck model can cause the two strands of the molecule to approach a state of close alignment, decreasing the chirality and weakening the spin(charge)-Seebeck effect. "However, what is notable," Bai said, "is that pure spin current with zero charge current can be achieved in terms of the gate voltage, which represents the perfect spin-Seebeck effect." The article, "Thermally driven spin-Seebeck transport in chiral dsDNA-based molecular devices," is authored by L.L. Nian, Rong Zhang, F.R. Tang, Jun Tang and Long Bai. The article appeared in the Journal of Applied Physics March 6, 2018 (DOI: 10.1063/1.5019753) and can be accessed at http://aip.scitation.org/doi/full/10.1063/1.5019753.